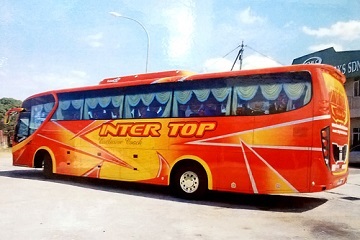 Positioned in Pudu Sentral, Inter Top Express is an emerging express bus company that offers bus services from Pudu Sentral to Hatyai, Changlun, Bukit Kayu Hitam, Kuala Perlis, Kangar, Jitra, Alor Setar, Sungai Petani, Sungai Nibong, Butterworth, Sungai Bakap, Nibong Tebal, Parit Buntar, Bagan Serai, Simpang Taiping, Yong Ping, Skudai, Larkin and Golden Mile Complex. 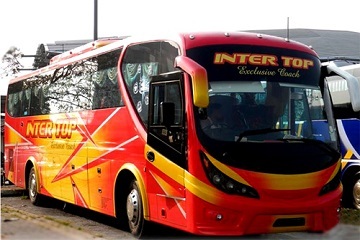 Inter Top Express ensure their customer heaps of comfort by offering good seating capacity and plenty of leg room rest so that you can ease yourself for the long hour journey travelling. Travel with Hatyai Inter Top Express, with a piece of comfortable mind and enjoy your journey. Being a partner of Easybook, now passengers can get to book Inter Top Express bus tickets via this platform. Kaunter 49, Pudu Sentral, Jalan Pudu, 50100 Kuala Lumpur, Malaysia.